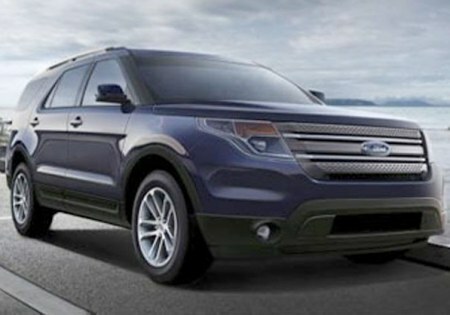 This photo of what is purportedly the next-generation Ford Explorer is doing the rounds of the internet. While many believe it is the real deal, we believe it is simply a manipulation of an existing spy shot. Even then, based on the spy shots, this is likely identical to how the new SUV will look like. Said to be debuting in early 2011, it could either be badged as a 2011 or a 2012 model. The 2011-2012 Ford Explorer will be losing its offroad abilities as it switches over from its existing body-on-frame chassis to a unibody based on the Flex crossover. The Explorer itself will become a tall crossover, but will retain some sort of “terrain control” system that seems to be lifted straight from former division Land Rover, along with a bit of their styling. New Ecoboost engines are speculated to include a 230 hp 2.0L turbo 4-cylinder and a 300 hp 3.5L V6, both possibly with a new dry-clutch auto-manual gearbox. Expect the new model to reach dealers by the middle of 2011.